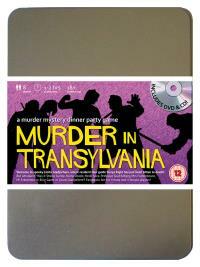 You've been invited to play the role of SHEILA SUCKLE in Murder in Transylvania. Who killed Sonya Right? Welcome to Castle Gladjorhere, home of the world’s one and only Transvampire with a soul! Visitors from all walks of life have come to witness the thrills and chills of this genuine Transylvanian house of horror, all of which will be revealed by the resident tour guide Sonya Right. But shortly after dinner Sonya is found in her room with two small puncture wounds in her neck. Join us to find out who sucked the life out of her! Countess Gladjorhere (she drinks every last drop!) Costume Suggestion : With your low-cut black velvet dress and dyed black hair to match, you are the vampiric vixen all men desire. Your long, black painted fingernails complete the picture. You sometimes go by the name of Countess Gladjorhere, but everyone here can call you Sheila. You can’t believe how lucky you were to meet the Count when you moved to Transylvania a year ago. It was love at first sight and you got married straight away. You’re hoping to soon start a little Transvampire family.